I did warn you mention that I'd tried a couple of variations when I was rocking and rolling in the pizza. 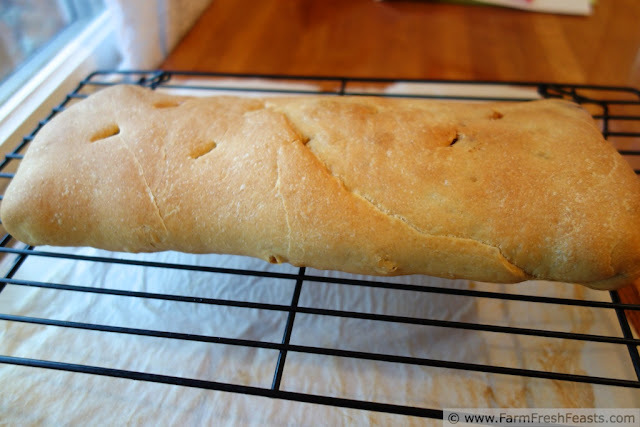 Since my spouse also likes mushrooms, I made a mushroom variation of the Birthday 'boli. Not one to waste perfectly good browned ground beef, I added a generous cup of sliced mushrooms to the meat left in the skillet from the basic 'boli. Coupled with a Fresh Tomato Pesto then cooked down until thick, it turned out most excellent. This got me thinking about more veggilicious 'boli fillings, so in addition to the Thanksgiving Leftover Remake 'boli that's in the can already, stay tuned for more rolled pizzas. This is fun! Just the way a Friday night should be, you know? Preheat oven to 400 degrees Fahrenheit. Preheat a large skillet over medium heat and add a turn of oil. Brown the ground beef then drain off the fat. Add the mushrooms and onion and cook until they give up their juice, another 5 minutes. Add the fresh tomato pesto and cook over medium low heat until thickened. Set aside. Refer to my Basic FFF-a-boli for more details on how to do the kitchen gymnastics, but I'll cover it quickly here. 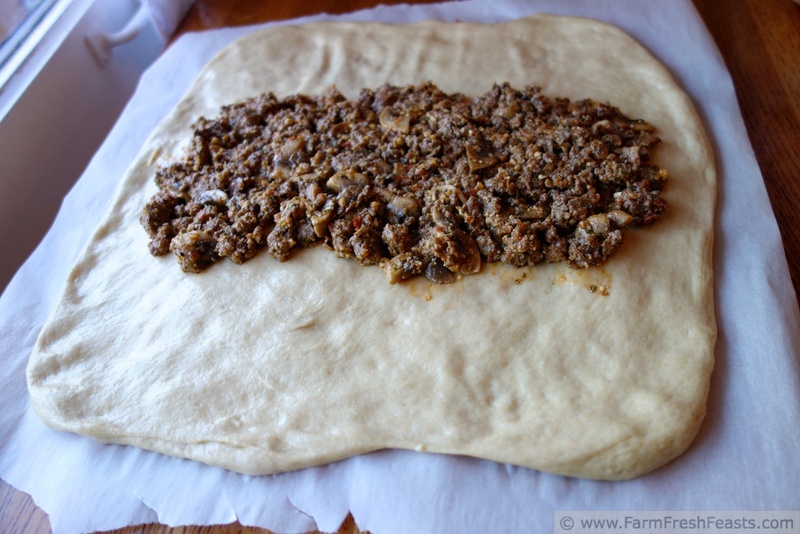 On an oiled piece of parchment paper, roll out the dough into a rectangle. 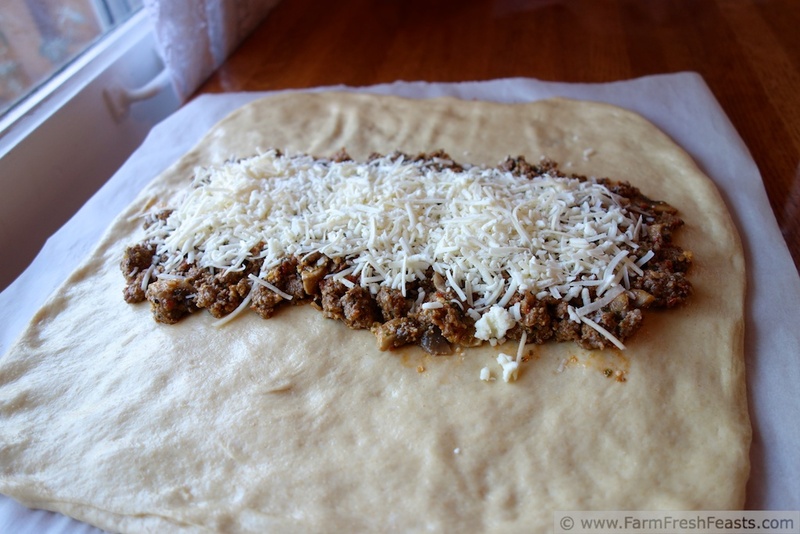 Spread the meat and mushroom mixture across the middle third of the rectangle. Top with cheese and spices. Fold one of the un-topped thirds over the filling. Fold the other side over the filling. Flip it over (good photos here). Brush the top with olive oil and poke a few slits in it. Bake on the parchment for 25-30 minutes, then slide the 'boli off and finish baking on your stone or cookie sheet until the crust is nicely browned, another 5-10 minutes. Serve in slices. Then suggest veggie variations for the next 'boli I feature! This post is celebrating Friday Night Pizza Night with the talented bloggers of the Farm Girl Friday Blog Fest at Let This Mind Be In You, the Clever Chicks Blog Hop at The Chicken Chick, What's Cookin' Wednesday at Buns In My Oven and Taste and Tell Thursdays. We love pizza for breakfast here! I don't mind making 3 pizzas on Friday nights, because that means that leftovers are available for one or more weekend meals and for "mom, I'm hungry, when's dinner" moments. Kirsten, that looks wonderful! I love stromboli, but I can never get mine to fold as beautifully as that. I guess I'll just have to keep trying until I get it right - it's a good thing they taste good even when they aren't pretty! I have better (or at least more thorough ;) photos on my Basic FFF-boli post, but for me the trick to folding was, as always, an oiled piece of parchment paper--but just picking up the parchment and folding it over, then patiently waiting for the dough to detach, fall, and land on the filling. Because the dough wants to be with the other dough, if that makes sense. When I take pizza crust out of a bag, I don't pull it out, I flip the bag inside out and let the dough fall onto my (oiled piece of parchment paper) surface, because it will all come out that way, not tearing and leaving bits in the bag like it does when I try and pull it out. Which is a long-winded way to say you are right. They do taste good no matter what they look like! Your pizza nights look like a lot of fun - your kids must really look forward to them? The kids and the spouse. Honestly, there have been times that I could take or leave pizza, but someone else ALWAYS says "aren't we having pizza tonight?" so I make a pizza. I like it when they suggest combinations, since it's usually something I haven't thought of before. Very nice! Not a mushroom fan, but I love ground beef in anything, especially mixed with tomatoes! I'm happy to eat all the mushrooms since you're not a fan. For you, I would suggest the turkey pesto FFF'boli that will appear here in November--it was an excellent change of pace after the turkey. Kirsten: I love your "stromboli-ish recipe. it is definitely something the hubby wuld love for me to make. Especially if you put pepperoni in it? 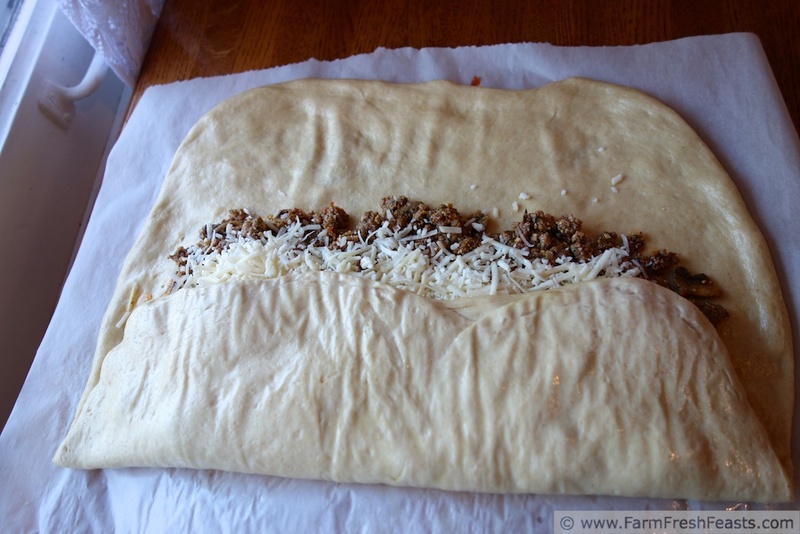 Growing up, my first exposure to a rolled pizza was a Nic-o-boli from Nicola Pizza in Delaware, so I never think "stromboli" first, I think "Nic-o-boli". Wow, this looks amazing!! I love the mushroom, meat & tomato combo, wish I was having this for dinner tonight! I'm replying to comments before breakfast, so everything looks good to me. Yesterday at the Food bank I tried a chicken/bacon/mushroom/spinach/feta on garlic sauce pizza, and I could go for that right now. Looks beautiful! Beef and mushrooms are a great combo. 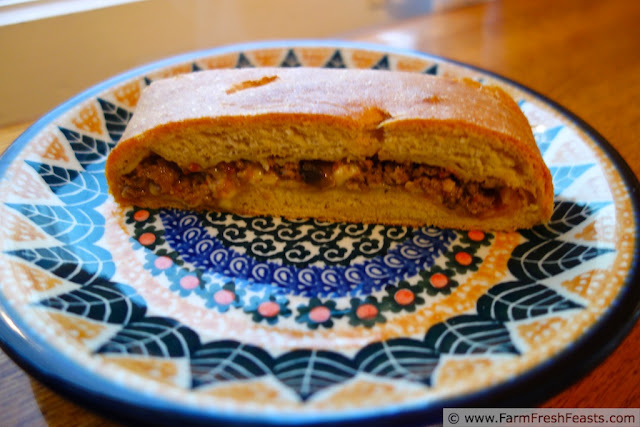 I'll file this idea for my next calzone - yum! I'm glad to help fill your files, you sure help me fill mine. Yum - this looks delicious! We love beef & mushrooms. I love making fun and tasty dinners like this on Friday nights! Better you than me--by Friday I am just ready to coast into the weekend, so I appreciate not having to *think* about what's for dinner. Though I usually make my doughs earlier in the week, and have thought about toppings before Friday, so everything comes together pretty easily. Great idea to try with lots of leftovers! I consider myself lucky that my family is happy to try all my repurposed leftover concoctions. Well, the spouse will try every one, the kids are not fans of mushrooms that are in visible pieces! Back to stuffed pizzas I see (and appreciate). I would love to try your Fresh Tomato Pesto. I am intrigued and so ready for fresh, local tomatoes. I want a caprese salad and it's too soon. I used up the last of my put up Fresh Tomato Pesto just last Friday on a couple of pizzas. (I'm kinda psyched, because I took it outside and took a photo of it--photobombed by my son taking out the compost and the dog being a dog, but I did take a second photo that will work for the monster How To Make, Use, and Put Up Fresh Tomato Pesto post that will come out of my head and onto a screen near you this month). Here's my caprese tip, that I will try first before officially recommending it--buy fresh mozzarella when it is marked down, freeze it, and use it in your caprese. Which sounds delicious BTW. 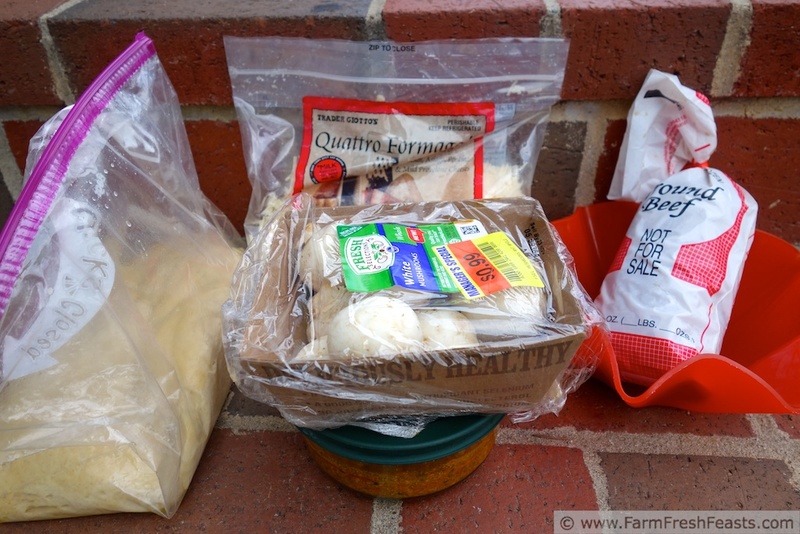 I froze and thawed (marked down) fresh mozzarella with great success in pizza.